Heartworm disease is a serious and potentially fatal disease caused by worms that live in the pulmonary vessels (the vessels that carry blood to the heart and lungs) of infected pets. These foot-long worms (They look like strands of spaghetti –gross!) can cause severe lung disease, heart failure, and damage to other body organs. Up close and personal with heartworms. They look more like strands of spaghetti than actual worms. Image source: American Heartworm Society. Are dogs and cats natural hosts for heartworms? Dogs are a natural host, meaning they provide a welcoming environment for heartworms to mature into adults, mate, and produce offspring. If left untreated, one canine can potentially harbor hundreds of heartworms in their body. Unlike dogs, cats are not a natural host and provide a rather inhospitable environment for heartworms to mature. In most cases, heartworms will not survive to the adult stage. However, this does not mean that our feline friends are in the clear. Immature heartworms can still cause damaging effects, in particular, in the form of a disease called heartworm associated respiratory disease (HARD). The mosquito is the primary transmitter of the disease from one animal to another. For example, a mosquito that bites and takes a blood meal from an infected dog, picks up baby heartworms that were circulating in the dog’s bloodstream. In their new host, the baby heartworms develop and mature into infective larvae. When the mosquito bites another dog, cat, or wild animal, the infected larvae are deposited onto the surface of the animal’s skin and enter the new host through the mosquito’s bite wound. 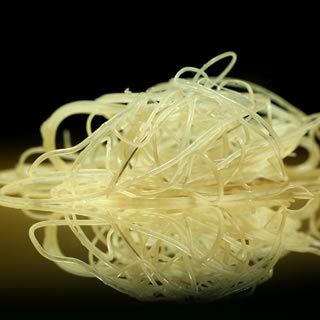 Once inside the new host, it takes about six months for the larvae to mature into adult heartworms; mature heartworms can then live for 5-7 years in dogs and 2-3 years in cats. 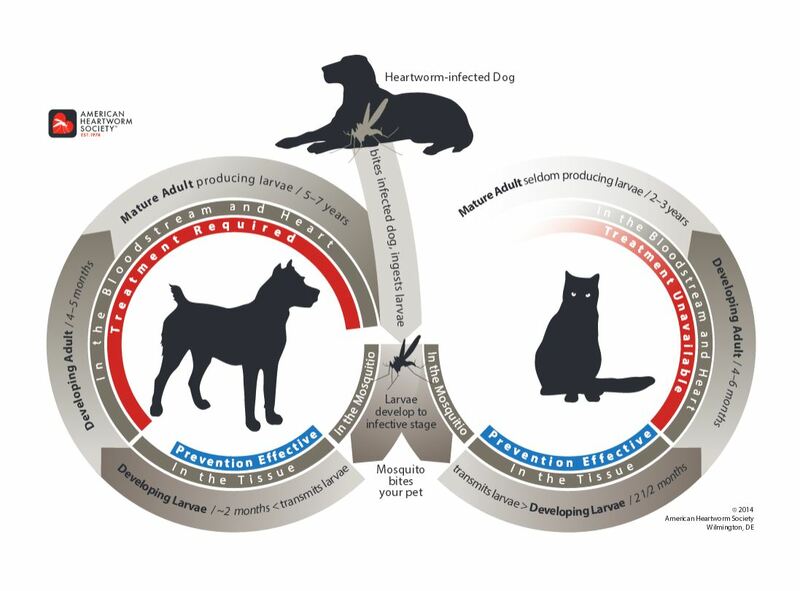 Comparing the heartworm life cycle in dogs and cats, starting with the mosquito bite. Remember, it only takes one bite from an infected mosquito to infect your pet. Image source: American Heartworm Society. One of the most common signs in both dogs and cats is no sign at all until the disease has well progressed. Some advanced symptoms include asthma-like persistent coughing or difficulty breathing, fatigue or lethargy, decreased appetite, and weight loss. Dogs harboring large numbers of heartworms can have sudden blockages of blood flow to the heart, causing cardiovascular failure. Cats can also have severe lung damage, resulting in sudden collapse or sudden death. As you can see, by the time symptoms set in, prevention and treatment is usually too late. The medical work-up and treatment for heartworm disease in dogs is very expensive, painful, and requires strictly resting the pet for several months to limit the risks of complications (and complications can be very serious in some pets). The diagnosis is much more complex in cats. Currently there is no treatment and medical management is very expensive and challenging. 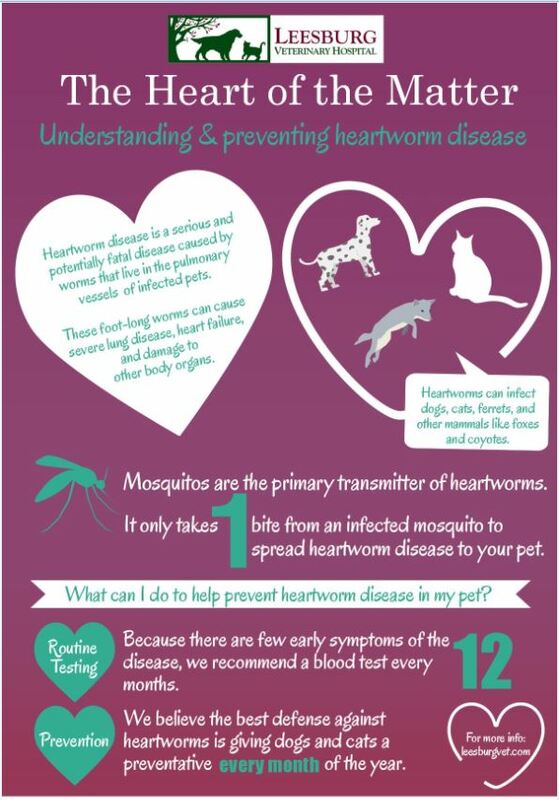 Because there are so few early signs of the disease, routine testing to detect heartworms is very important. 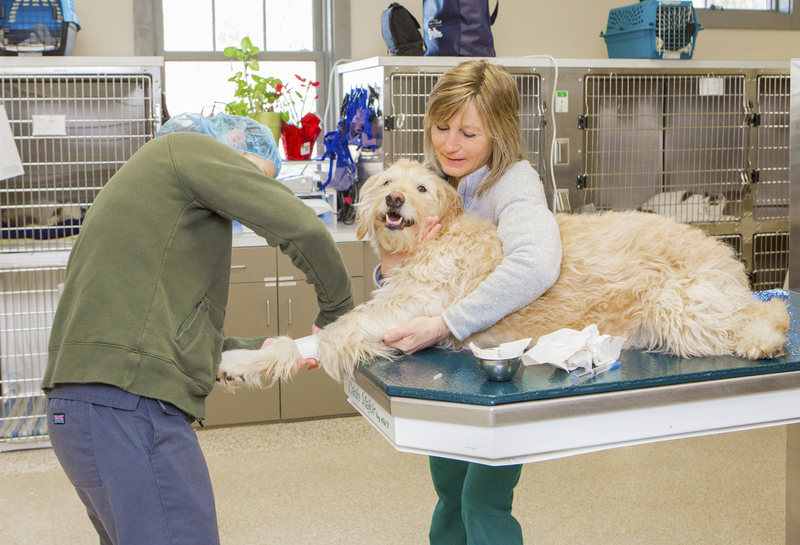 For dogs, we recommend an annual blood test performed during your pet’s yearly exam. This simple test requires just a small blood draw and is processed in LVH’s in-house lab. In many instances, we can give you the results before you leave. (As a bonus, this blood test also screens for three tick borne diseases – Lyme, Ehrlichia, and Anaplasmosis). Heartworm disease in cats is difficult to diagnose with a blood test. Because heartworm disease is very different in cats than dogs, cats are not at much risk for adverse reactions when starting monthly prevention if they happen to be infected; therefore we do not require a yearly blood test to begin or restart preventatives. 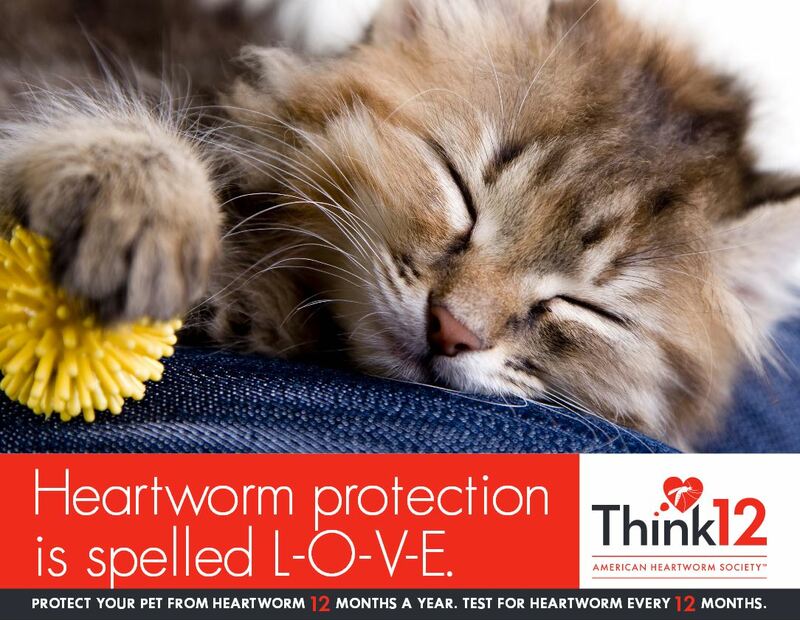 We believe the best defense against heartworms is giving dogs and cats a preventative every month of the year. How does heartworm preventative work? Heartworm preventatives can be in the form of a chewable tablet or a spot-on topical medication. In both cases, they work by killing the immature (larval) stages of the heartworm parasite. This includes the infective heartworm larvae deposited by the mosquito, as well as the following larval stage that develops inside the animal. Once the immature larvae become adults, they cannot be effectively eliminated by preventives. Because of this, it is very important that heartworm preventives be administered strictly on schedule each month without interruption. Administering prevention late or skipping months altogether (like in the colder winter months), can allow immature larvae to molt into the adult stage. Yes, we do recommend a heartworm test every year for dogs. Even if you are a responsible pet owner keeping your pet on prevention year-round, an annual test ensures the prevention is working properly. Heartworm medications are highly effective, but like all medications, nothing works perfectly 100% of the time. And even if one monthly dose is missed, your pet will be unprotected. Some pets may also spit out their pills when you’re not looking, vomit, or rub off the topical medication. If your pet does contract heartworms, the earlier it is detected the better chances he has for a full recovery. It is also important for your veterinarian to ensure your pet does not have heartworms before beginning or renewing a preventative prescription. Administering preventatives to a heartworm positive pet can have severe or even fatal medical complications. It takes months for dogs with heartworms to test positive (Remember, it takes six months for the infective larvae to mature to adult heartworms) so your pet may have been infected with larvae at last year’s exam, but did not read positive on that test. For more infomation on the benefits and importance of annual heartworm tests, download this great handout from the American Heartworm Society’s website. At Leesburg Veterinary Hospital, we recommend the following preventatives for dogs and cats, Remember, it’s less expensive to prevent heartworms that to treat them! Dogs: Sentinel Chewable tablets. A meat-flavored, chewy tab that not only protects against heartworms, but provides protection against intestinal parasites including whipworms, hookworms, roundworms, and tapeworms. 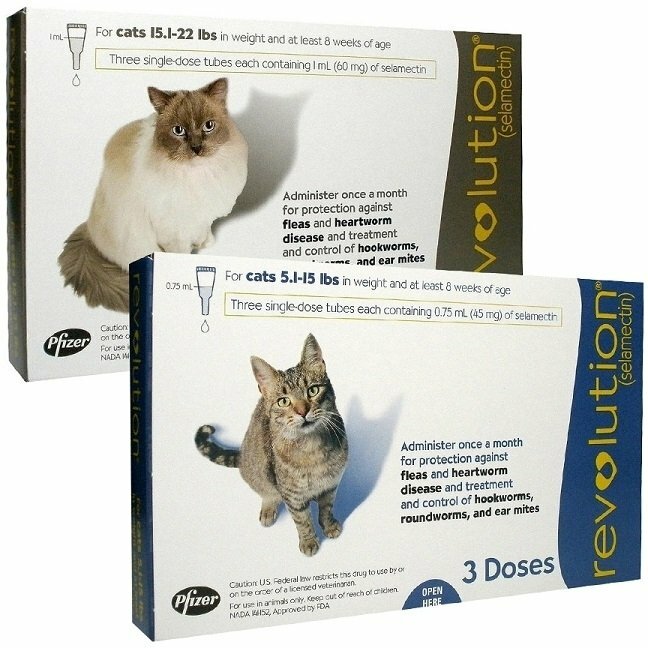 Cats: Revolution topical medication. This easy-to-apply topical treatment also has the added benefits of protecting against external parasites (fleas and ear mites) and internal intestinal parasites (hookworms and roundworms). Ideally, it’s best to renew your pet’s heartworm preventative during their annual exam. Not only does this keep you on track (your pet should be due for their refill!) but it gives you the opportunity to discuss with your vet how your pet is doing on the medication. We hope this article provides some clarity on heartworm disease and the importance of prevention. Again, if you’re looking for more information, please check out the American Heartworm Society’s site, in particular, the bottom of this page has a great commonly asked question and answer section. You’re veterinarian can also discuss any questions you may have at your next appointment. We wish all of our clients and patients a happy Valentine’s weekend – keep those hearts healthy! ← Take control of your pet’s medical records with the VitusVet App!